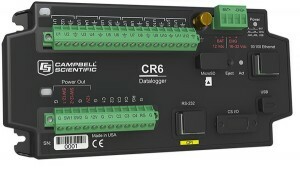 The CR6 measurement and control datalogger is a powerful core component for your data-acquisition system. It combines the best features of all Campbell Scientific's previous dataloggers and added faster communication, low power requirements, built in USB, compact size, and improved analog input accuracy and resolution. The CR6 also introduces the new universal (U) terminal, an ingenious way to allow virtually any sensor-analog, digital, or smart-to be connected to any U terminal. This is also the first multipurpose datalogger capable of doing static vibrating-wire measurements.